Owning a dog entails certain responsibilities. You, of course, have to feed it and clean it. The dog also needs exercise and so a nice walk every day is advisable. This is an activity that most dog owners lack at times. For some, it means the dog getting over excited and running off, with you in tow, holding the leash. Sometimes you might lose your grip and helplessly watch as your dog runs off at full speed. So, having a dog leash that grants you total control is something that’s highly welcome. The retractable dog leashes solve this problem. 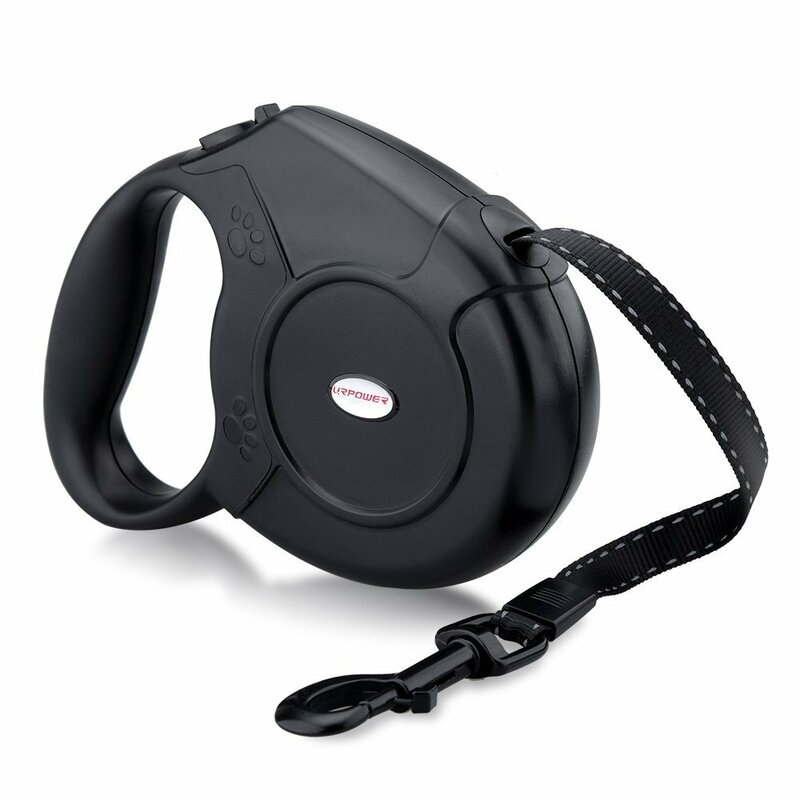 With these, you’ll be able to control how far your dog runs, all the while maintaining a good grip on the leash. What features do the best retractable dog leashes have? Retractable leashes consist of a long cord that hides inside a housing. When in use, the cord is extended outwards, allowing the dog to run as far as this cord allows. What’s great about these products is that they enable the owner to decide how far the cord stretches thanks to a locking mechanism. So, you want a leash that has a long enough cord. Most offer at least 16 feet of length. The handle must be designed to comfortably fit your hand. You’ll be running with your dog and will need a firm comfortable grip. And, of course, the housing has to be strong enough to handle the arduous outdoor life. Lucky for you, we’ve sifted through the vast dog leash options and emerged with a list of five that fit the bill. So let’s get right to the reviews. We start out our search for the best dog leash with this one from Tao Tronics. It’s an elegant looking product, clad in an eye-catching blue and black combination. If this color scheme isn’t your preference, there’s also an orange and black option. The housing is ergonomically designed to fit snugly in the palm of your hands. The break and lock button is within your thumb’s reach, very conveniently placed. The casing as a whole is made of plastic and this keeps it lightweight without compromising on durability. The leash itself is made of a strong and durable nylon material. This ensures that no matter how hard your dog might tug, the cord won’t snap. Still, there’s freedom to wander as this leash is 16 feet long. Made for dogs that weigh up to 110 pounds, the Tao Tronics is certainly meant for most if not all dog sizes. Latching onto the dog’s collar is a chrome plated hook with a reinforced plastic joint that keeps it attached to the nylon leash. This while combination is built to last while ensuring both you and your dog enjoy your time in the outdoors. And with the free roll of plastic bags, cleaning of your dog’s messes will be a painless affair. Power enters the dog leash scene with their rugged looking product. It’s all clad in black. The black communicates a sense of strength which reassures the user. And it certainly is a well-built retractable leash. Made of ABS plastic, the housing is not only environmentally friendly but also withstands the rigors of the outdoors. The handle’s design is well thought through to enhance comfort. It’s ergonomically built to ensure your hand wraps around it securely without causing a strain even after a long walk. There are two buttons placed right above the handle, within reach of your thumb. There’s a large button which, when pressed, locks the cord in place. The smaller button releases this lock when pulled back. Speaking of the cord, it’s an ample 16.4 feet long. This is a good thing because you can allow your dog to run as far as it wants without you ceding control. If it goes far enough, just press the large button and keep the dog from running any further. The cord is made of nylon, known for its strength. You should be certain that it won’t break. It can handle dogs of up to 66 pounds making it perfect for small and medium sized ones. This dog leash stands out from its peers. Not in terms of functionality because, as you’ll see in this review, it performs as well as its counterparts above. However, it stands out in looks. And that’s the first thing that will draw you towards it when you first lay your eyes on the Triton. To say it’s aesthetically pleasing is an understatement. 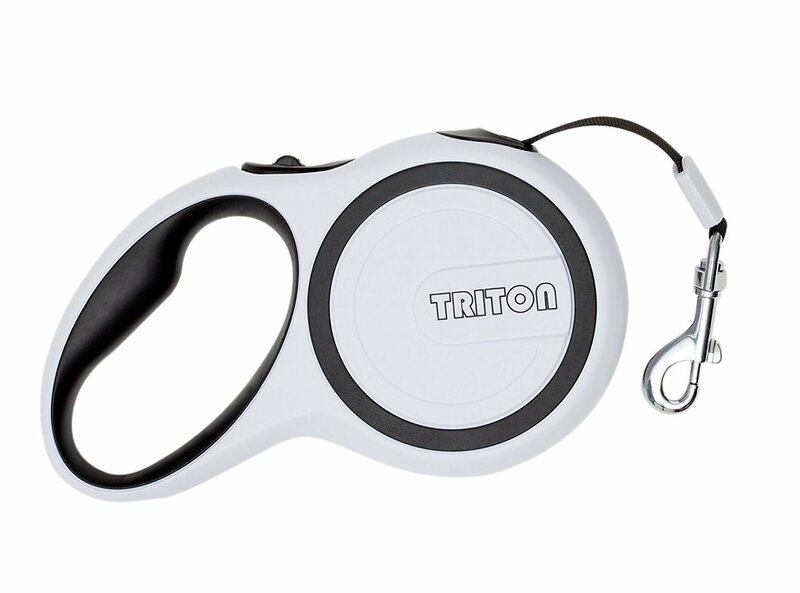 Triton took time in designing this retractable dog leash. The time spent shows. Clad in white accentuated by black lines, the Triton dog leash is a beautiful workmanship. The handle is ergonomically built to ensure total comfort for the user. Complementing this is its anti-slip rubberized build which also ensures a secure grip is maintained. The curves stand out and give it an elegant look. But it isn’t just about the looks. This leash is also quite durable. The casing is made of a strong plastic that’s built to withstand the arduous outdoors life. The cord is made of 100% nylon. As we know, this nylon material is popular for its ability to resist pressure, keeping it from snapping. This cord gives the dog a 16 feet running distance, more than enough to give it total freedom. And with the easy break and retract controls, you too will have peace of mind, maintaining total control of how far your dog can go. This is a dog leash with a personality. In fact, it comes with more than one personality which matches your own. Choose from four bright and fun colors. There’s the pink, blue, red and black. Whichever you choose, you get the same amount of functionality and durability. That’s why the Flexi dog leash earns a slot in this review. The shape and design are much like the others above. It’s got smooth curves that characterize the handle. Ergonomically designed, Flexi didn’t go wrong when building a leash that’s comfortable to the hand. The brake and retract button is conveniently placed right above the handle. This is the perfect position to ensure your thumb reaches it easily, allowing you to control the cord’s reach. The cord is an ample 16 feet length and is made of nylon material. 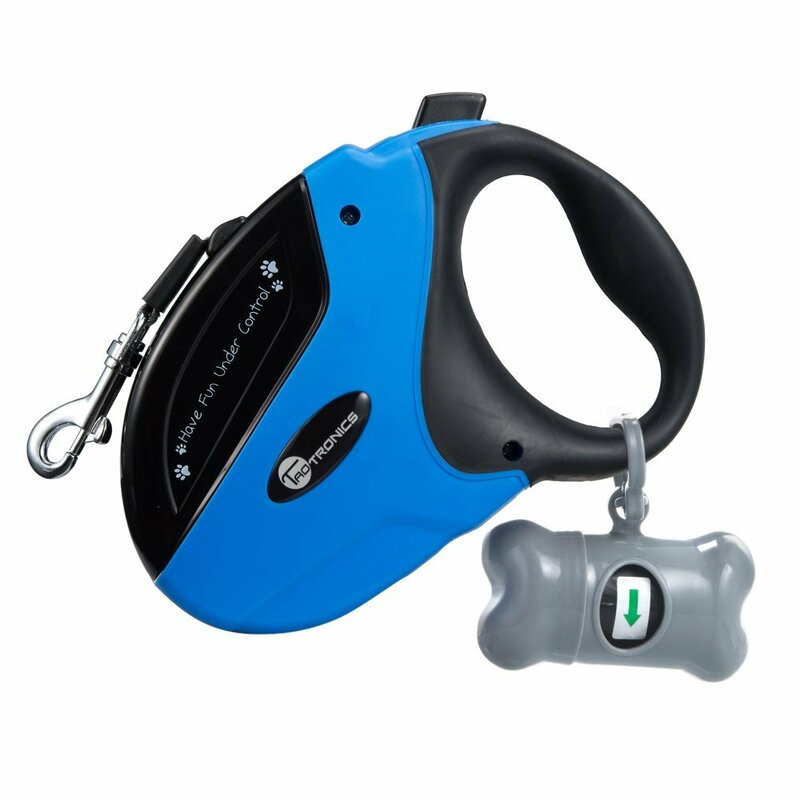 This gives the leash a capacity to handle dogs of up to 26 pounds in weight. It’s therefore excellent for small and medium sized dogs although Flexi does manufacture larger leashes for the bigger dogs. But whatever the case, we know this is a great product because it’s made in Germany. And when the Germans engineer, they do so in excellence. Keeping you in total control is an intuitive braking system, easily operated from the button above the handle. With this, you have the control over how far your dog can go. 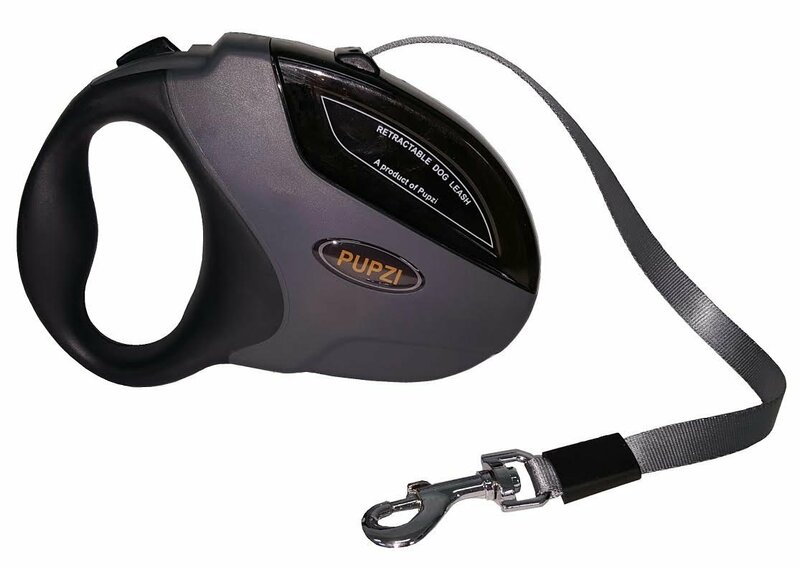 Joining the list of retractable dog leashes is the PUPZI retractable leash. And it comes as a worthy competitor to the others in this review. It sports the now familiar dog leash look, all clad in black and gray. Its design is one well thought through with all the right curves and contours at the right places. The handle is designed with ergonomics in mind, made for the palm of the hand. No matter what size your hand is, this dog leash is comfortable to hold ensuring a firm grip no matter the weather. The cord is made of nylon, a strong and lightweight material. No matter how hard your dog tugs at it, you don’t have to worry about it breaking. At the tip of this cord is a strong hook which attaches to the dog’s collar. The cord has a total length of 16 feet freeing your dog to run as far as it wants. 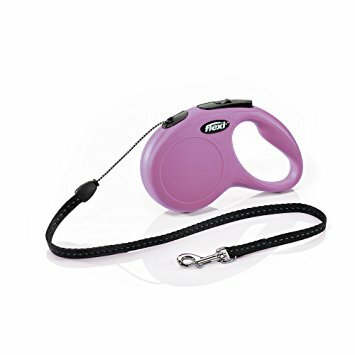 However, if you need to control the dog’s running distance, the locking mechanism is secure enough to hold the cord in place. PUPZI then do something most manufacturers don’t. They say that if you aren’t happy with the product they’ll refund 100% of your money, no questions asked. So there you have it, five of the best dog leashes in the market. However, you’re probably wondering which one takes the crown. Yes, all of the above are great products but we’re looking for the one that rises above the lot. It has to be highly durable, remaining stoic under extreme stress. The best retractable dog leash is the Tao Tronics. It has a strong cord that can hold dogs of up to 110 pounds. This makes it a favorite for all dog owners. The handle is also quite comfortable to hold and above all, it doesn’t cost an arm and a leg.